If I had to leave town in a hurry and only had time to pick up just one cookery book, this would be the one. It was the first book that really got me interested in food. I’d left home, gone to art college in London and was living in a grotty flat in a rundown part of town. We covered the damp patches on the walls with Biba posters and lit candles stuck in the necks of wine bottles when we had no money to put in the electricity meter. I was learning to feed myself and living mostly on vegetables and lentils but could very occasionally splash out on some meat and wine to cook the boeuf bourguignon she describes. I remember how fiddly it was making the bouquet garni. Some of the recipes I couldn’t even begin to attempt then, ingredients we take for granted these days just weren’t available in London in those days. Even garlic and herbs were things you had to search for. But Elizabeth David wrote about food and cooking in a way that no one had before. This isn’t about how chefs do it, she learned from ordinary people, how they cooked at home. 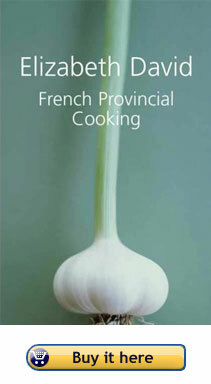 Even if you don’t want to cook this is a great book to read. She didn’t just write about the food and how to cook it, she also wrote about people, places and memories. In our modern world of gadgets it’s fascinating to read about the old ways of doing things. For example, she dedicates a whole page to clarifying a consommé or aspic jelly, with a beautiful illustration of how to do it, an improvisation of two chairs, a cloth and a bowl. She describes five different ways to boil an egg. I’m still wowing friends with her gâteau au chocolat. This is wonderful stuff. My copy is about forty years old now, a bit tatty, the pages yellowed. But it’s still the cook book I turn to most. The new edition is laid out differently but the content’s still the same and I’m sure you’ll enjoy it as much as I’ve enjoyed mine.